Professor David Waggoner posted the following chart yesterday on Minyanville that I think is worth noting. Professor Waggoner commented "The next intermediate level pivot down is around 882. It is a 50% retrace of the entire move up from the low and is a possible pivot for an extension of the entire A-B-C pattern off the low. It is also a natural support level as shown on the chart. These intermediate level targets are based on the interpretation that the move up from the March low is a corrective retrace of a 5 wave set down from October 2007. I concur with Professor Waggoner's analysis. The important point in above chart is that the move up from the March low is likely a correction, not the start of a new bull market. That information alone is worth far more than any details as to how the market may decline from here. Many patterns are still in play. Depending on the index, you can count these moves off the bottom as a simple A-B-C correction as shown, or as an A-B-C-D-E wedge. We'll know which one was correct in hindsight, but both suggest stocks will eventually make new lows - either sooner (in 2010) or later. A multi-year top could be in. Fundamentally, it should be in. In the short-term, if we have in fact seen the end of the rally, the SPX will likely decline to the 200 day moving average, currently at 916. 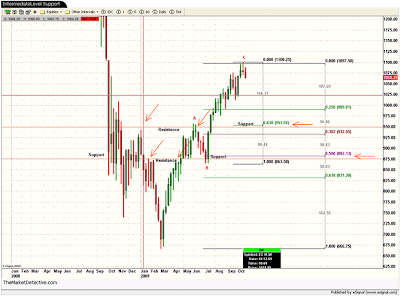 By the time we get there, it could be in the neighborhood of the 38% retrace line near 933. If things go quickly, it could be down there by the end of the year. This is not a recommendation to short; this is a notice that risk is tremendously high and a top could be (and in my opinion should be) in. The market may have other ideas.